When you have a musical centered around a giant ape that wreaks havoc on New York City, you know you’re going to be in for something different. Adapted from the 1993 film, King Kong-Live On Stage is an original production conceived and staged in Melbourne, Australia. The musical premiered on 15th July at the Regent Theater and has been extended till February next year. Due to the demands of the complex set, the production will run exclusively in Melbourne before it takes on Broadway and other parts of the world. Hence, yours truly took the chance to catch the beast in action as he causes chaos down under. Underneath all the grandeur and destruction, King Kong is really a love story at heart. Ape meets girl, ape falls in love with girl, but unfortunately circumstances dictate they can never been together. A simple story as it may be, it was executed and fleshed out well on film, especially in the 2005 film version directed by Peter Jackson. Whilst one cannot exactly compare stage to screen, I must concur with other critics that the music and lyrics written for the stage did not really do much to elevate the plot. The opening numbers tracing the female protagonist Ann Darrow’s journey to “stardom” seem rather confusing and rushed. Ann’s transformation into a leading lady by dubious filmmaker Carl Denham was interspersed with flashy cabaret-like dance numbers which seemed more like fillers for the thinly sketched plot. The only songs that really caught my attention were from the second act. Full Moon Lullaby, which Ann sings to King Kong so as to coax him to sleep, was melodious and affectionately delivered. The number Get Happy is an upbeat tune performed by a group of dancers as Kong unleashes his rage all over the city, effectively evoking a sense of extreme irony. Necessary criticisms aside, I do admit I enjoyed the production for other reasons. Performances by the cast members were solid all around. Adam Lyon’s powerful vocals and portrayal of the unscrupulous Carl Denham was perfect to a Tee .Another standout was Chris Ryan as Jack Driscoll, Ann’s love interest and first mate of the ship that sails to Skull Island( domain of the mighty Kong). Jack’s earnestness and love for Ann were captured well by Ryan , and the actor’s charisma inevitably latches onto you the more he is on stage. I should also mention that he is extremely easy on the eyes. Esther Hannaford, already an established musical theatre star in Australia, possesses just the right amount of vulnerability and maturity as Ann Darrow. As for the star of the show himself, King Kong is an astounding 6-metre puppet built by animatronics workshop Global Creature Technology. 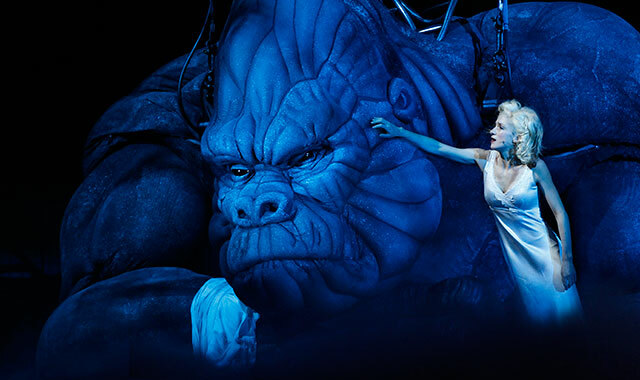 The creature is a sight to behold right from his first appearance on stage, with a variety of facial expressions portraying Kong’s rage, pain and even his love for Ann. So realistic is the puppet that I actually imagined a scenario where it came to life and charged into the crowd. Credit must also be given to the six puppeteers operating Kong, and watching them at work maneuvering the gigantic creature effortlessly was really an eye-opening experience. The elevating stage which moved up and down to resemble the motion of a ship was also a particularly ingenious creation, and one can really see the effort put into such a massive production. 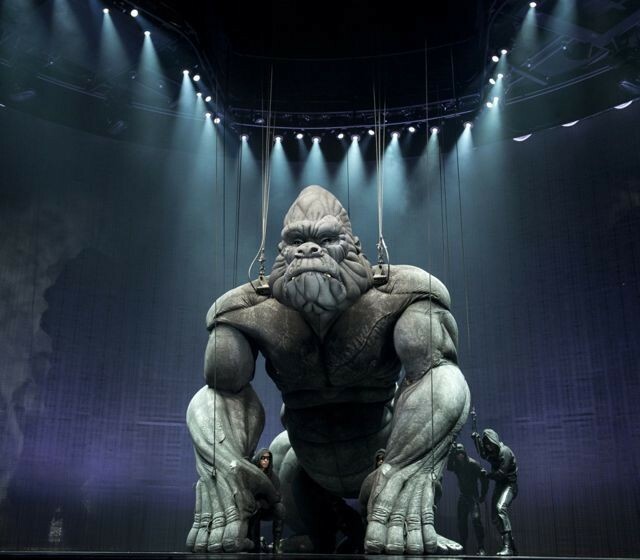 Whilst King Kong may not be the best musical story-wise, the ground-breaking visual effects are enough to warrant a visit to catch this production if you’re in the city. Coupled with a talented cast and elaborately designed set, the show manages to make up for its faults , and you actually feel a tiny pang in your heart as the mighty beast meets his tragic downfall at the bottom of the Empire State building. Visit http://kingkongliveonstage.com/ or http://www.ticketmaster.com.au for more information or for bookings.